When I think of this special holiday, I can’t help but think of how precious Christmas was when I was a child. Decorating the tree was a celebrated family event that my Dad made fun and memorable. We watched as he set up the tree, put lights on it, and Mom took pictures. Then we would all hang garland and ornaments. We’d all stand back and watch as Dad put the star on top and then plugged in the lights. It was beautiful! The best part was how much fun we had together as a family! But then came the first Christmas after my Dad passed away. I was 11 and very determined to honor him by putting up a tree, but no one else wanted to bother with it that year. I will not go into the details of that rather distressing story, but I learned after a parent dies, things will never be the same without them. Children don’t choose to be orphaned. It is thrust upon them. God has a very special place in His heart for fatherless children and widows. He also has ways of blessing those who bless them – I have seen it from both sides. As it turns out, God sent this orphan to a nation of orphans to bless them with His love. In truth, there are no orphans of God – only sons and daughters who belong to the King of kings! The Father gave us His best when He gave Jesus, and for me Christmas has become a time to honor God and His great love for us by giving to children who have nothing. Honestly, as I reflect on this, I know that feeding children will honor my Dad’s memory more than putting up a tree ever could. Especially because he used to always tell me, “Eat everything on your plate – there are starving children in Africa!” (I know many of you can relate to this form of “dinnertime encouragement.” J) But he was right – there are. The children I pray to bless are ones I’ve seen with my own eyes, have held, and hugged. I’ve prayed for them and brought them food; I’ve seen their faces filled with joy and relief knowing they will eat that day. 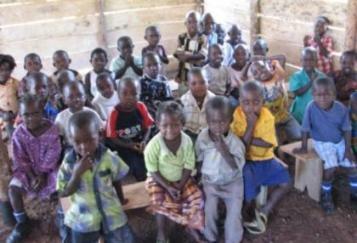 Last year we raised funds for a Christmas dinner for children in a remote village in Uganda where my spiritual son, Peter Sewakiryanga, founded a school and church. The village children were able to celebrate together and hear the story of Jesus’ miraculous birth! My heart jumps at the chance to bless them with a special treat as they again are told Christ’s story this year. Not only that, but I want to raise enough to help them put food in their pantry that will last well into the New Year. This is my Christmas wish!!! Peter is a man of superb and humble character and one I don’t hesitate to help. I know all given him will go to bless the children. Together let’s show there are people who love and pray for them, and are genuinely thinking of their well-being. Let’s hug them from afar! James 1:27 comes to mind. Please help me bless the children and lighten the burden of their leader. May the love of Christ be shed abroad! May you be blessed by the Father’s love this Christmas and throughout the coming year!